When we started out homeschooling we were doing all the fun little preschool things. We had a different theme each month and we finger painted and played in our backyard. I had sensory bins full of rice and beans and we would scoop and pour for hours. We just finished 5th grade. Wow! I never imagined what life would look like with an almost middle schooler. When you began your homeschool journey did you picture where it would lead? Honestly, I never did. Back then we just took things one day at a time and enjoyed the journey. I didn’t think about elementary school and beyond. It’s probably good that I wasn’t too focused on the future because I think it would have terrified me! But now it’s here. We have completed elementary school and are embarking on middle school. If you are a homeschool mom of littles, just know that it really does fly by. It seems like only yesterday we were learning to letters and making cute craft projects. Now we’re deep into our study of Spanish and Latin. Math and grammar are getting tough and my brain hurts by the end of our school day. 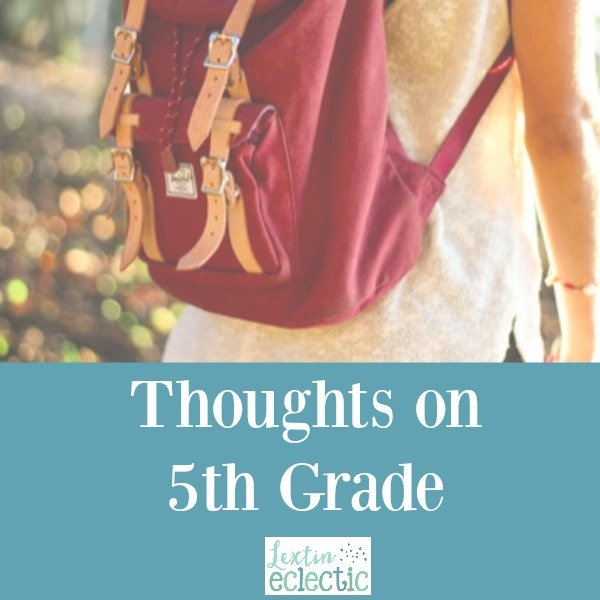 My oldest has finished 5th grade and I’ll share a few of my thoughts on our last year of elementary school. How did our 5th grade year look different than previous years? This year we tried something entirely new. Instead of me starting school with Curly (my 5th grade daughter) at 6 AM, I let her get started on her work without me. I didn’t join her in the homeschool room until closer to 6:30. This gave her time to get a head start on her work before I started school with her. It also really improved her attitude and focus. She felt very accomplished to have already crossed a few items off her list before I started working with her. She was really efficient in that first 30 minutes and it set the tone for the rest of our school day. Curly has become a fairly independent learner – partially because I’ve tried to steer her toward independence and partially out of necessity. I have several other kids to school plus a baby and preschooler. In order to get school done with everyone, my older kids have been forced to work on a few things on their own. However, it has really paid off. Curly works well on her own and often takes a stack of books to the quietness of her room to get work done. I even bought her a backpack so she can carry her books around the house. We enjoyed a simple and fun introduction to Latin last year in 4th grade. But this year we really got serious about our Latin studies. I turned my daughter loose with her Latin materials and even had her teach it to me because I was often busy with younger siblings while she watched the DVD’s and worked on her course. It was fun to see her making connections between English, Spanish, and Latin. Up until this year, we had only done fun informal logic workbooks from companies like Prufrock Press and the Critical Thinking Company. This year was the first time we started to actually study informal logic. We worked through the Fallacy Detective and learned about all the different types of fallacies and practiced finding examples of each one. I plan to do one more year of informal logic before we begin a more formal study, but it was fun to work on this subject together. Now my daughter finds fallacies everywhere! I chose a few of our subjects to be taught by someone other than myself. My daughter worked on Latin and writing with DVD courses. We also started a BJU online course for science where she streams videos and follows the assignments that are outlined online. My only role was to grade and oversee these courses. It was really freeing to not have to sit with her and teach every single subject to her. And I think she really enjoyed the variety of having a couple of different “teachers” during the homeschool day. Before the start of our year, I spoke with my daughter about her interests and I let her help choose some of what she studied. She was really determined to learn more Spanish and she wanted to study archeology and also to learn about the minerals and jewels. Can you say random? However, we did fit in all those topics into our year. I found an indepth Spanish program and I found archeology and rocks and minerals science texts that we read together. I’m so glad I took the time to include her in our planning. For the first time, my oldest participated in more than one extracurricular activity during the year. She participates in American Heritage Girls, but this year she joined a swim team and swam all year long. Just as I’ve tried to let her take the lead in choosing her school subjects, I’ve also tried to let her choose her extra activities. This year she found her passion and she’s been very busy! Where did I see the biggest changes and growth? Curly went from speaking only a few simple sentences and phrases in Spanish to being able to understand paragraphs of simple Spanish text and even writing fairly complex sentences in Spanish. Her Spanish abilities are about to surpass mine (and I took multiple years of high school Spanish)! She has been very dedicated to studying foreign languages. I finally saw major spelling improvement this year! Curly is starting to consistently spell things correctly and her spelling skills are carrying over into her other subjects. She not only spells her words correctly during spelling time, but also when she writes compositions. She makes fewer silly spelling mistakes now. This year Curly has really become a helper with some of her younger siblings. She reads to them and helps them with her schoolwork. She even sits nearby and listens to Ladybug’s (Kindergarten) piano practice each day so she can help her if she forgets a note. She has started to step into the role of teacher to her younger siblings and they often come to her with a math question or if they need help sounding out a word. Curly has taken over breakfast preparation for every day. She sometimes makes something the night before, but her job has been to make sure there is food on the table every morning. She has become quite the little cook and is very independent in preparing food and even in doing other chores. In order to teach Curly how to take notes, I gave her a notebook with several sections – facts, people, discoveries, and events. As she reads her history books she is supposed to write something in as many sections as possible. She also has a notebook for science where she writes down important facts and vocabulary words from her text. She is learning to take notes from a textbook, which is much less intimidating than taking notes from a lecture. But over time she will have developed the habit of looking for the most important facts while weeding out the less important details. We worked together to find the way that Curly can keep herself organized and plan her day. We found that a simple planner and a daily checklist is the best way to keep her on track. I helped her form a habit of writing herself a checklist each day and working through that list. Now she is able to work independently and not forget assignments because she can plan her day and finish her checklist. I feel like this year I’ve seen a huge change in my oldest child. She has become more thoughtful, more mature, more independent, and more focused. She enjoys having discussions with me on various topics and often dives deeply into various topics that interest her. It’s almost like I can see her progressing into that rhetoric level mindset. And of course, with that comes a little bit of arguing and some attitude. But I’ll take it, because it’s been so fun to watch her transition into more of a mini adult. So, how would I describe 5th grade? It’s a transition year. In this one year I’ve seen my daughter blossom into a small version of the adult I know that she’ll be in a few years. Suddenly she has opinions and she is ready to take charge of her own learning. She has become motivated and has started setting her own goals. She keeps her own calendar and likes to know all expectations up front. If you’re looking at middle school in the near future, be encouraged! These are fun years when you get to see your child grow and take ownership of their own education. Oh and stay tuned next week! I’ll be sharing some of my best tips for preparing to homeschool 5th grade!